Why choose Northwest Scuba for your scuba course? As a PADI 5 Star IDC Dive Center in Edmonton, we are one of the top dive centers in Canada and certify more divers than most dive centers in Canada. This is because we use the highest quality instructors along with an on staff PADI Course Director, flexible class schedules and the lowest student to instructor ratio in Edmonton. New courses on the way. Six Gill Shark diver, Underwater Model, Underwater Archeology, Research Diver, Gas Blender Instructor. The PADI Seal Team program is for young divers who are looking for action-packed fun in a pool by doingexciting scuba "Aqua Missions". They will learn about safe diving and what diving has to offer from wreck diving to underwater environmental awareness. 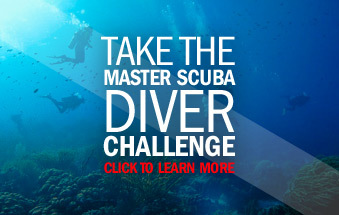 Looking for a convenient way to try scuba before taking the full course? Then this is your program. During the course of one evening, we will introduce you to the wonders of scuba diving in a safe environment. Just bring yourself and a sense of adventure and we will show you a whole new world under the surface. Have you always been curious about what lies beneath the surface? Now it's time to find out. Start the journey of a lifetime with the PADI Open Water course. It will change you forever. In this course, you will learn the basics of how to scuba dive. You will start in a pool and progress to the open water getting the necessary background knowledge along the way. If our course schedule does not fit within your schedule, you can even complete this course online. Do you have a specific interest in continuing your dive education? If so, we can help. With topics ranging from Deep Diving to underwater Photography or Videography, we can help you along. Often referred to as the most fun and rewarding dive course you can take, the Rescue Diver course teaches you to look beyond yourself and consider the safety and well being of other divers. You will learn how toprevent problems and, if necessary, manage dive emergencies. Northwest Scuba also teaches the Medic First Aid, EFR program from a certified heart and stroke instructor.Inquire about our First Aid Courses. Go Pro with PADI & Northwest Scuba! The Divemaster rating is the first step in becoming a PADI professional. Whether you are on a career path, or looking to improve your skills, the Divemaster course will expand your capabilities and make you a better diver. Throughout your Divemaster program you will work closely with a PADI Instructor expanding your diving theory, knowledge, and skills to a professional level. In addition, you will learn the techniques used by professionals to supervise diving activities and assist divers undergoing training activities. Are you looking for something extraordinary? To do something that others can only dream of? To open doors you didn't even know existed? All of this, and more, awaits you as a PADI Open Water Scuba Instructor. As a professional, it is important to continue your own education to stay current on diving trends and to increase your knowledge. Continuing education programs will directly benefit you in two ways; first you will increase your employability, and second, allow you to earn additional income. Northwest Scuba offers Instructor Level Continuing Education Programs to suit all career goals. You tell your students to aim for PADI Master Scuba Diver but do you really want to tell them that you can't instruct them the whole way to that goal? The Master Scuba Diver Trainer rating will allow you to do that and also sets you apart from the other dive instructors. Want to be recognized as one of the elite dive educators? The PADI Master Instructor embodies the essence of a true dive professional having demonstrated a thorough understanding of the PADI system of diver education, and put it into practice by training 150 or more PADI divers. They are dive industry leaders who help shape the development of future dive courses.